The Motorola Droid 2 Global is definitely the most unofficially available smartphone on the market right now. It holds that odd title for a couple of reasons. 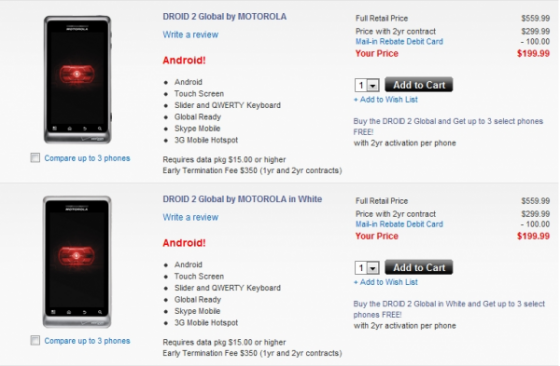 Verizon and Motorola have yet to make it official and yet it appears right next to the original Motorola Droid 2 on Verizon’s website. You can order it this very minute for $199.99. And if you want it in white? You can get it in that shade too. For those not up on the times, the Droid 2 Global is essentially the original Droid 2 with global roaming capabilities and a 1.2 GHz processor. It also has some increased security measures for you secret agent types (like the ability to remote wipe your SD card). What, you don’t believe us? Well, here’s Motorola right on cue with an official video that shows off all of the Droid 2 Global’s specs. You can head here to check it out for yourself. This might be as official as the Droid 2 Global is going to get so if you’re the traveling type or you just want a fast processor with your smartphone, it’s probably worth a look.